This is Bessie. She is a Rat Terrier and belongs to very dear friends of ours in Denver. But Bessie is camera-shy- as you can see she is hiding and did so as soon as she saw the camera. Apparently, when she was a puppy she got scared of a flash camera - and hasn't gotten over it. I think she avoids pictures because she is shy about her underbite where her bottom teeth protrude more than her upper teeth. 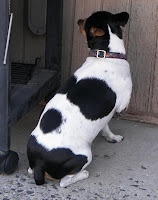 Other than that, she has perfect markings for a Rat Terrier. Bessie is smart and knows sign language. She does tricks for her morning "cookie" with only hand-signal commands. Quite impressive. She also likes to play ball and will bring you a ball to throw over, and over, and over again.